Useful takeaways from a recent Google training event. 05:17 – How to make your site mobile responsive? Alright, James here and I’ve just come back from a day at Google training yesterday. So I’m going to go through some of the highlights in today’s show. 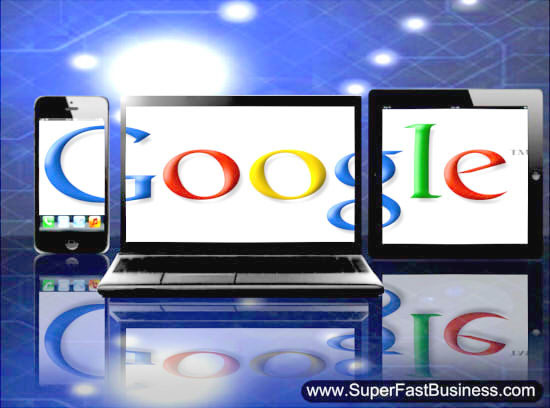 When I went to Google, one of the big things that we’re talking about is the multiple screens that people use. So I think it’s appropriate that I use the iPad mini to go through my notes that I took there. One of the things they talked about for SEO was how viral YouTube videos can really get presence so if you can be lucky enough to make a great video that goes viral, use it on your site. Google really favors YouTube for some reason, maybe because they own it. One of the big difference is the enhance campaigns and that is a new system for AdWords. You will be forced to migrate to it. And part of the research behind this is about how many people use smartphones, smart tablets and big screens and TVs and I’ll share some of those stats in a second. Another thing is, the image extension is being rolled out. I’ve been talking about image marketing over and over again and now they’ve shown that the AdWords with the three images where they must be relevant to the content, they must be relevant to the keyword, they must not have an advertisement in them, they must be good quality images, are showing that you can bump someone else off the top of the page. So if you see three picture ads that are highly relevant, that’s a Google AdWords image ad. And please put the best images you can on your website. I’ll even link to some training idea about image marketing just a few weeks ago because it was so relevant. I heard about this. They’ve got rules around white space, rules around logos, and must be relevant. So, image ad marketing’s big deal. For Google ads shopping, they recommend you publish a merchant fee, that you refresh it everyday, and that you optimize your products by flagging the best sellers and bringing them into their super ad group. The Keyword Planner is replacing the Estimator. So it’s bringing in three things into one. You can research your ads, you can estimate how much it costs and then you can start to group your ads together. So you’ll be forced to use that but it pretty much has the same functionality. There’s a lot more phone usage and this is the real core message from my visit to Google: You’ve got to be smartphone ready. I’m going to give you some stats on that. Now in analytics, you’ll be able to use multi-currency and of course they got a lot more enhanced social sharing metrics now. I think they’re trying to push Google+. You could also share dashboards much more easily with customers. If you happen to have customers, the Google dashboards are heaps easier in analytics now instead of the difficult process to login. And it will show Google display ads which is important. You can see impressions so you can see which ads are being used. So they say use remarketing responsibly. Use remarketing responsibly. We got a whole spiel on how to sell which is great but I think we’re all familiar with that. Now I have business services training being filmed right now. I’ve literally got a white board with the training modules on them and we have a lot of overlap there. But it’s about remembering we’re dealing with humans and go for that longer term relationship instead of that small budget, quick fix customer. So it’s all good stuff and they talked about processes. But then I want to skip down to the good part. This is the part about the multiscreen. You’ve got to be mobile friendly. Research data shows that consumers are using multiple screens to do things that they always ever did. They’re talking about TVs and laptops, tablets and smartphones and there’s some extraordinary results here, that 65% of consumers have a smartphone now in 2013. In fact, Australia is over 70% and US and UK is still over 50%. Fifty-five percent of businesses are using a mobile-friendly channel but everyone should be because over 80% of smartphone users use multiscreen for a purchasing path. And the interesting thing is that the smaller the screen, the less time people spend on the device, but the more often they are on the device. So high engagement, smaller bursts. But they start their transaction on a smartphone and then move to the desktop or the tablet to make the purchase, that’s very common. In fact, 97% of smartphone users will switch devices the same day. Fifty-nine percent of journeys start on the smartphone and then go to another device. That’s a huge statistic. Sixty-nine percent of people watch TV and use a smartphone or device at the same time and of those, 75% of the activities are disruptive. In other words, not connected to whatever they’re watching on TV but 25% are complimentary. So that means if you are marketing, you’ve really got to compete for attention. One in 10 searches on a smart device is triggered by television – 1 in 10. And search is the most common activity that people start with. So it was a pretty good day but the clear message is you’ve got to have a mobile ready website and people start their journey there and you’ve got to get people’s attention. If you need help making your website mobile responsive, then head long to ATLweb.com. That’s my website company and we can make your website work on any of the popular browsers. It’s called mobile responsive. You need to do it now. I hope you’ve enjoyed this update. I’ll catch up with you in the future episode. Found this useful? Leave your comments below. Great insights! Do you have any WordPress plugin that you will recommend to make my websites mobile? What’s your take on this vs. using a responsive theme on just one site? using a m. site makes sense for a lot of website owners. Responsive is a good cover all for blogs etc..
For me interesting part is image ad marketing.